On the Small Business plan and above, you can automatically Bcc your CRM every time you send an email. Here's how to set it up. 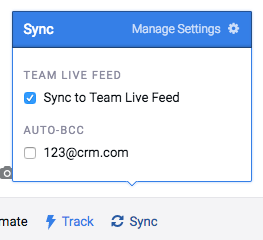 Go to your Mixmax CRM & Team Live Feed settings, and then scroll down to Auto-Bcc, as per the screenshot below. Add the email address to Bcc your CRM. You can also specify email domains and email addresses that you want to exclude from being logged in your CRM, shown here. You can also exclude a particular email by clicking the Sync button on the bottom bar of the compose window, and unchecking the box under Auto-Bcc.